Thai Vegetable Tuna Rolls: loaded with fresh summer veggies and Thai flavors, these tuna rolls makes for a delicious appetizer or meal. 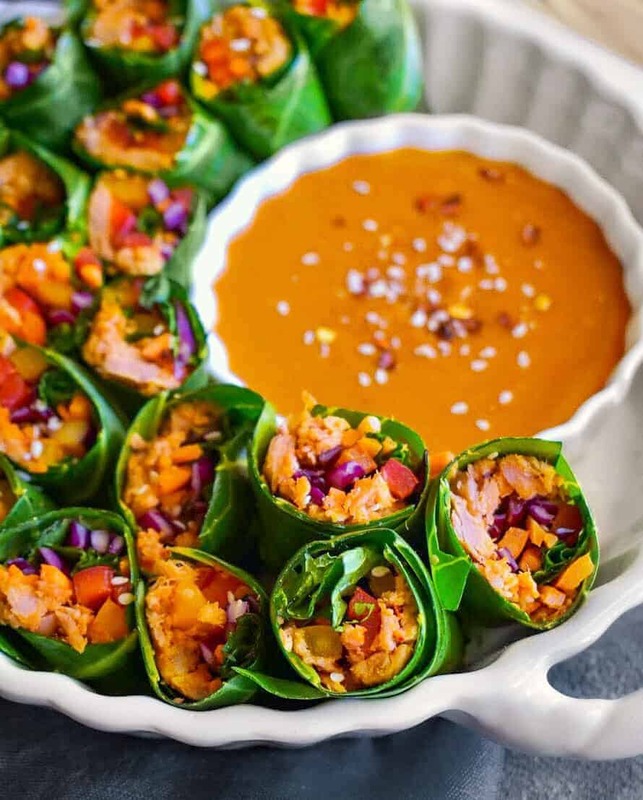 These Thai Vegetable Tuna Rolls are a perfect appetizer/light meal to celebrate the lasts of those summer days with friends and family. 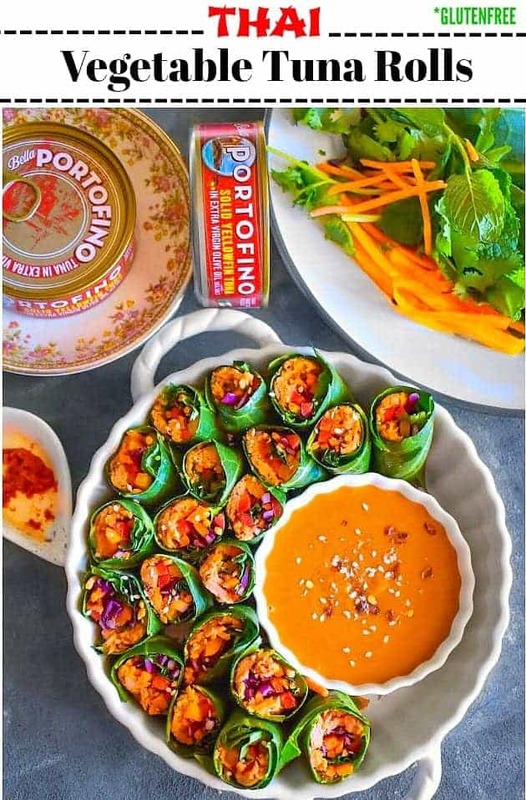 Made using Bella Portofino Tuna (Italian style), they are an easy way to add flavor and protein to our appetizer or meals. 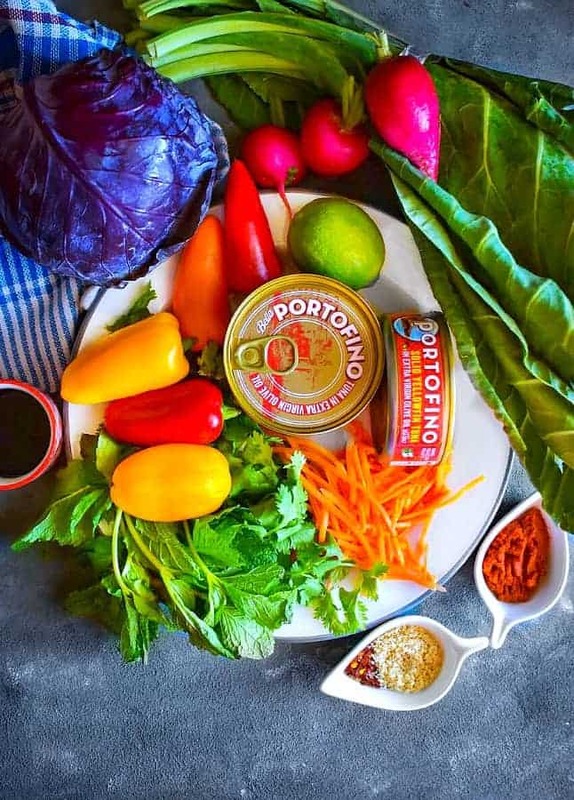 Bella Portofino Tuna is a staple in our pantry and we have created tons of recipe using them like Spicy Tuna Cakes, Patties, Sandwich, etc. 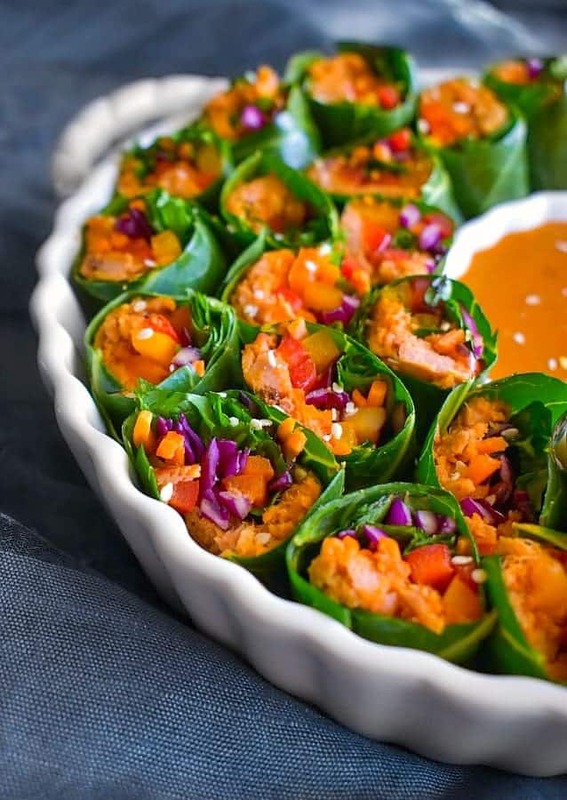 And these gorgeous Thai Vegetable Tuna Rolls literally ruled our labor day weekend party. It’s the mix of fresh summer veggies, along with tender texture tuna and Thai spices that gives these rolls such refreshing flavors. Also, to make it even lighter and crispier, we are using collard green leaves to roll everything. Which also makes it a perfect glutenfree recipe. Making the recipe is literally as easy as it looks. The ingredients can be found easily in stores near you. Once you have everything with you, then simply thinly slice all the veggies except the collard green leaves (that we will use for the roll). This tuna has only three ingredients – wild caught, hand selected Albacore and Yellowfin tuna, along with EVOO and salt. 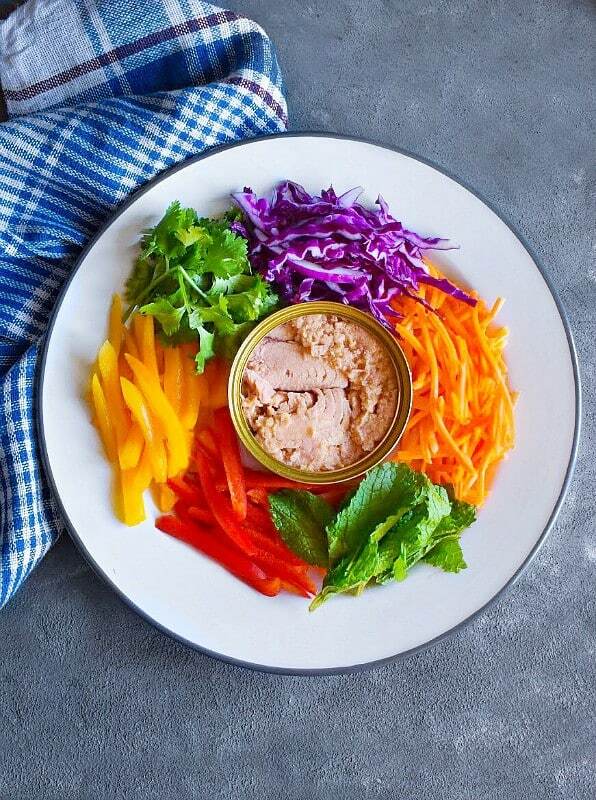 The EVOO gives it a smooth, mellow flavor and the tender texture is perfect for all your tuna recipes. With all these benefits, the Bella Portofino Tuna definitely delivers on taste and superior quality. Now let’s start making our Tuna filling for the rolls by simply mixing it with Thai spice mix (picture below). 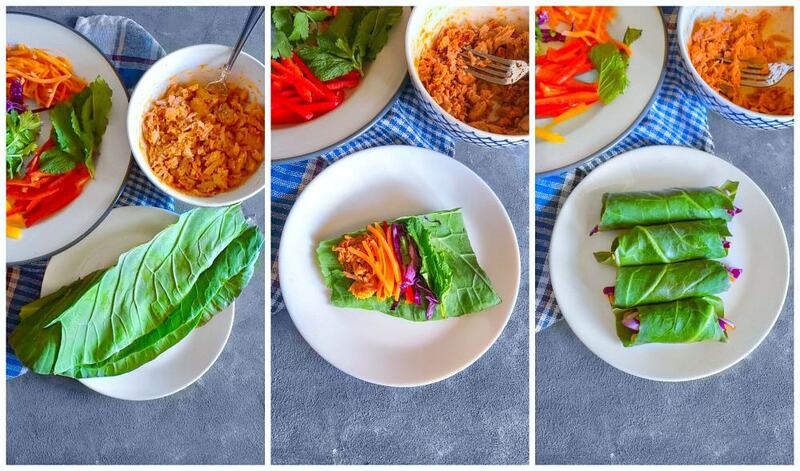 Then simply add some of the Thai tuna mix, freshly chopped veggies and herbs on each collard leaves and roll tightly. I usually place the rolls next to each other as that helps them form the roll shape easily. 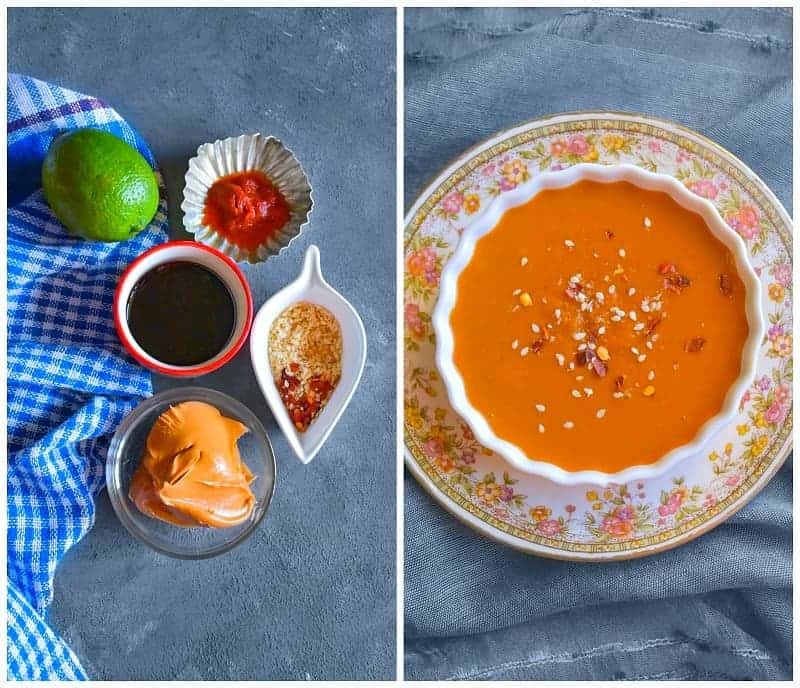 Now, you definitely need a sauce/dip to serve rolls, hence what’s better than a Spicy Thai Peanut Sauce? And my version is absolutely easy and just 5 ingredients. 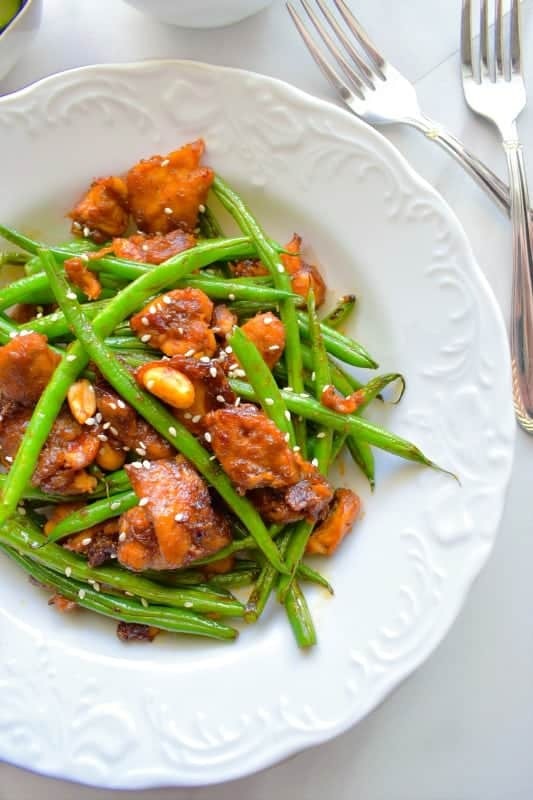 Simply mix and whisk the ingredients to get a smooth spicy peanut sauce. 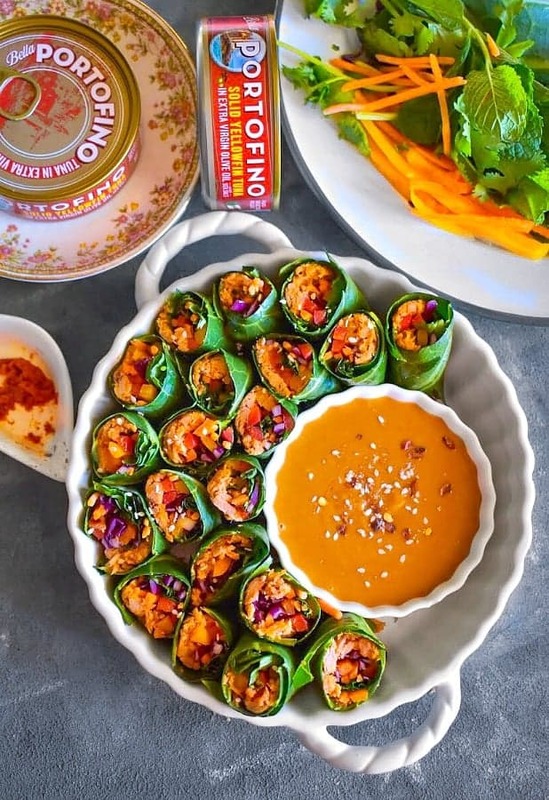 Once the sauce is ready, I simply cut all the rolls into halves and arranged it in a serving platter along with the spicy Thai peanut sauce. 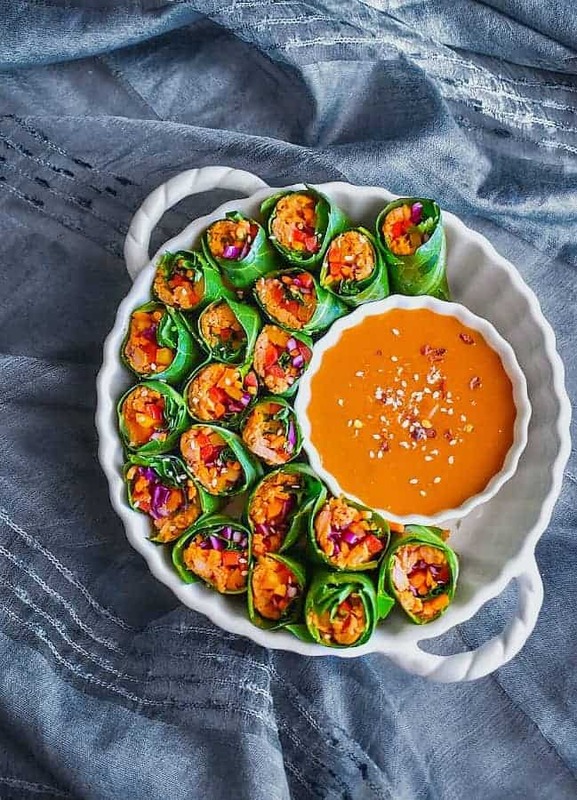 The fun part about these Thai Vegetable Tuna Rolls is that they can be made in advance (3-4hrs) and simply store them in the fridge. So you have time to go about arranging the house or just take a quick short nap before you start your party. 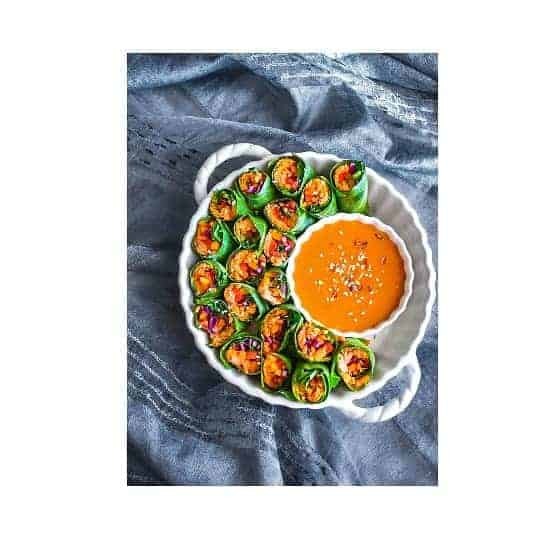 I highly recommend that before you get started with all Autumn/Fall recipes, try these Thai rolls with its light-fresh flavors and enjoy the last of summer days. 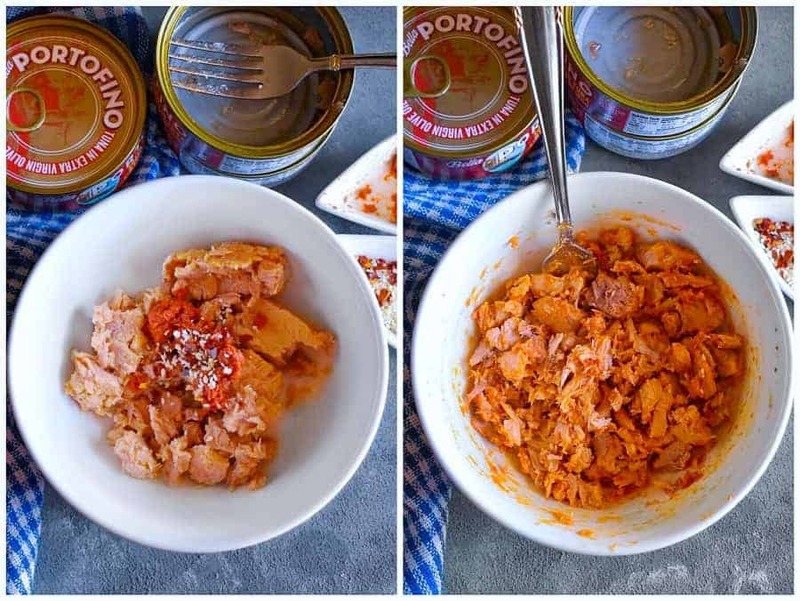 Also, stock up on these Bella Portofino Tuna so that you can whip up this or such easy recipes in no-time. You can also visit Bella Portofino Tuna for more recipe inspiration or info on products. In a large bowl, add tuna, Thai spice mix and mix everything together. Take half of the collard green leaf and lay it flat on a plate. On one end of the leaf, add 1tsp tuna mix, few sliced cabbage, peppers, 2-3 herb leaves (mint, cilantro & basil). 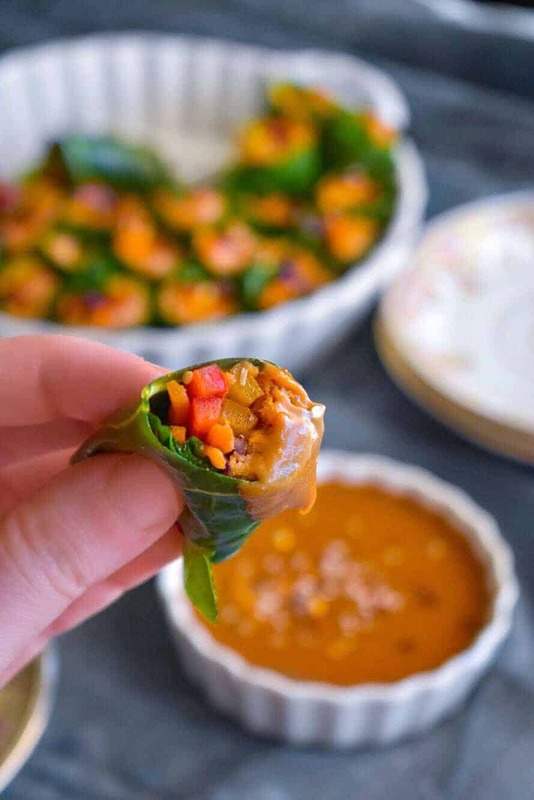 Make sure all the ingredients are added on the same corner of the leaf and now tightly roll the leaf (see pictures in post). Similarly, make all the roles s put them close to one another(this helps seal the leaf ends). Once all rolls are made, cut the role in the middle. Place the Thai Summer Tuna Rolls in the serving platter (its best to place them in a huge bowl, stacked next to each other). * This is a sponsored post written by me on behalf of Bella Portofino Tuna. 8 Replies to "Thai Vegetable Tuna Rolls"
This Tuna is one of the best. The flavor is amazing! So much better than other brands. Totally agree with you. It tastes so yummm and goes perfectly with so many other recipes. These are so pretty to look at! I love how bright the colors are and not to mention love EVERYTHING you put in these! Great appetizer for sure! That peanut sauce sounds like the perfect accompaniment! These look amazing! So they are full of color and oh that sauce! That sauce looks delicious! This is the best way I’ve ever seen canned tuna prepared. So colorful. I think this will become my new favorite way to make it!